Cut the butternut squash lengthways. 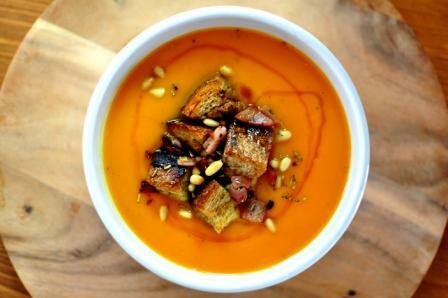 Drizzle the honey over the squash and season with salt, pepper and nutmeg. Put into a baking tray face up with enough water to cover at least an inch of the squash. Cook in the oven for around 40 minutes or until you can easily put a knife into the squash. Meanwhile, cut the onion, peel and dice the sweet potatoes and crush the garlic. Sweat the vegetables in a pan with a sprinkling of salt. After 2-3 minutes, add in the chicken stock. Leave to stand until the squash is ready. When the squash is ready, scoop out the flesh and add to the stock and other vegetables. Cook for another 5 minutes. Cut the bread into chunky cubes. Heat two teaspoons of butter and a teaspoon of oil in a pan. When the pan is hot, throw in a good few pinches of rosemary and and the bread and toss until crispy. As the bread is turning brown, throw in the garlic and pine nuts (be careful as the pine nuts will toast very quickly). When the croutons are crisp, add the mixture to the top of the soup - and maybe another twist of salt. 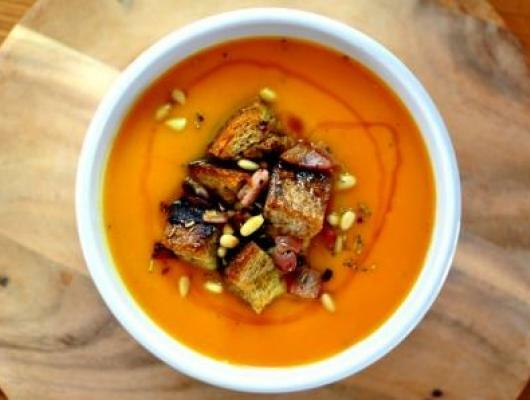 A delicious and filling butternut squash and sweet potato soup with a sweet honey finish. All topped off with some savoury rosemary croutons.